In rotary screen printing, colored paste is forced through the open areas of a cylindrical printing screen that rotates as the fabric moves beneath it. In contrast to intermittent flat screen printing, rotary screen printing is fully continuous with fabric speeds up to 50m per minute, if adequate drying capacity is available. 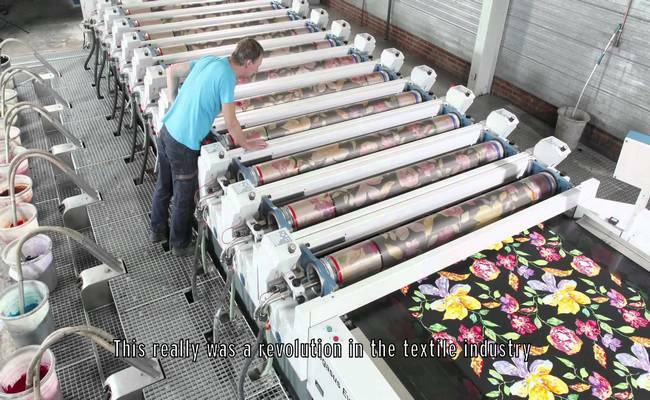 Rotary screen printing is now by far the major printing method for textile fabrics. The printing blanket is shorter than in flat screen printing because cylindrical screens occupy less fabric length. Their diameter is 3.14 times less than their circumference. The use of a thermoplastic adhesive on a neoprene coated blanket is common since this simplifies washing. A pump delivers paste from a container into a central pipe that runs inside the full length of the screen. This pipe also supports the squeegee. The paste runs down onto the rotating screen from holes in the pipe. These are larger towards the far end to give even paste distribution. The paste collects under the stationary squeegee, which forces it out through the holes in the rotating screen. This is the opposite of flat screen printing where the movement of the squeegee forces the paste onto the fabric. The squeegee is a flexible stainless steel blade, since rubber squeegees wear away too quickly. The blade curvature depends on the applied pressure and can be varied by adjustment of the side bearings. Uniform blade pressure across the width of the screen is essential to ensure even transfer of the paste to the fabric. Printing machines from Zimmer use an electromagnetic roller squeegee. The screens are strong enough for rotation provided they are under tension along the cylindrical axis. They fit onto light aluminium end rings that can be driven from either one or both sides. The blanket and screen drives are usually linked. Once the screens are in place the paste delivery tubes and squeegee assemblies are fitted. On starting to point, the screen height can be adjusted and the screens can be advanced or retarded to give correct registration of the pattern. Direct rotary screen printing does not allow the large repeats of flat screens. Large repeats can, however, be printed by automated intermittent raising and lowering of the rotating screens. In this way, two or three different rotating screens print the same color to give a large repeat. Only a portion of the screen surface is open so that when the screens are raised the paste is held in a closed area and does not drip onto the fabrics.